The Tidel Till Storage Vault, when deployed with the Series 4, offers a convenient and secure way to store till drawers used in the day to day operation of the store. The Till Storage Vault can store up to four standard size till drawers, with room for smaller additional items such as coin rolls or lottery tickets. The Till Storage Vault also offers an optional rolled coin drawer, which provides a convenient way to access change throughout the day. The coin drawer contains 8 individual coin slots and easily slides out for quick and efficient access to rolled coin. The provided drop slot in the till storage vault allows for the manual depositing of checks, money orders, or other items that cannot be deposited via the bill validators. The Till Storage Vault also offers an optional small side vault, which includes a drop slot, that can be used for secondary storage of smaller items such as rolls of coin, lottery tickets, or other items requiring secure storage. Much like the bottom vault and acceptor vault doors, the door for the optional small vault requires individual user log in to access. 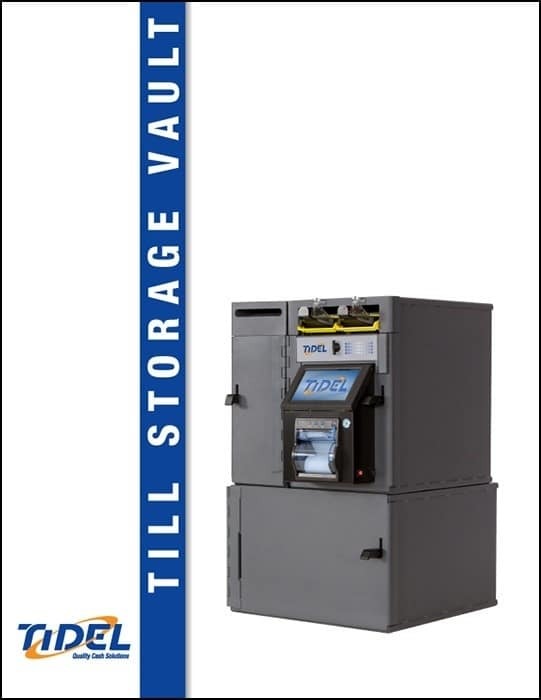 The Tidel Till Storage Vault offers unparalleled flexibility and convenience for secure storage, automated note deposit, and access to coin. By storing the tills in a secure vault near the register, versus the back office, the Tidel Till Storage Vault eliminates the need to utilize a secondary storage safe, thereby optimizing retail store space, and accelerating the start of shift process. Interested in the Till Storage Vault?